There are two mature, reliable and affordable options to produce green electricity. Giant King Grass is suitable as a fuel for direct combustion (burning) in a 100% biomass electricity-generating power plant, and also as a feedstock for an anaerobic digester producing biomethane that fuels an internal combustion engine that turns a generator to produce electricity. VIASPACE has financial models for both approaches. The ideal solution is a Giant King Grass plantation co-located with the power plant. This simplifies logistics and minimizes cost. Giant King Grass has energy content, physical properties very similar to corn straw that is used routinely as a fuel in biomass power plants. The fast-growing nature and proven, dependable energy characteristics of Giant King Grass allows power plants to run 24 hours a day, seven days a week without interruption or variable output due to availability or inconsistent performance of the fuel. Direct combustion (or "direct-fired") systems burn biomass in boilers to produce high pressure steam. The steam turns a turbine connected to a generator-the same kind of steam-electric generator used in fossil fuel power plants. As the turbine rotates, the generator turns, and electricity is produced. This is the simplest and oldest way to generate electricity from biomass. 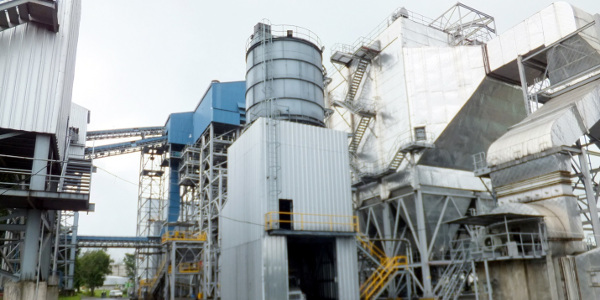 To increase the energy-producing efficiency of direct combustion, power plants also operate cogeneration facilities, which capture waste heat and "secondary" steam and use it to heat buildings and provide steam and heat for industrial processes such as ethanol production or drying of chemical and wood products. Giant King Grass and other grasses and straws have different properties than wood or coal and require a different boiler technology. 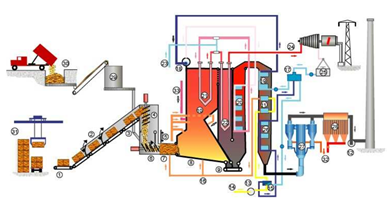 Biomass power plants are usually 10 to 35 MW in size which is much smaller than coal power plants at 500 to 2000 MW. Most of the world's biomass power plants use direct combustion to produce renewable and low carbon electricity. Existing coal power plants can be readily modified to replace up to 20% of their coal with biomass pellets, but their boiler technology cannot accommodate 100% biomass. In a warm area, Giant King Grass that is co-located with the biomass power plant can utilize year round--just-in-time-- harvesting to eliminate the need for baling and long-term storage of the fuel. This is a major logistical advantage that lowers costs. 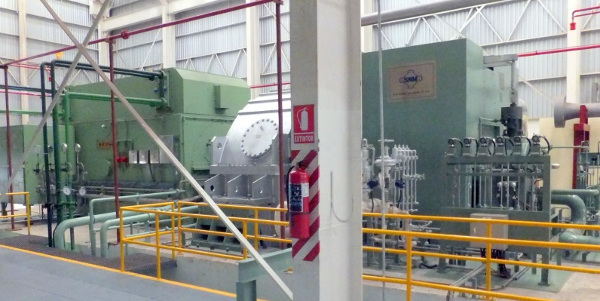 Direct combustion power plants have a modest capital investment, and the equipment is widely available. The costs of generating electricity using Giant King Grass is compared to other technologies under the Giant King Grass tab. Giant King Grass and other biomass can produce reliable, low carbon electricity 24 hours a day which is needed for "base power" applications. Anaerobic digestion is a series of biological processes in which microorganisms break down biodegradable material such as Giant King Grass in the absence of oxygen. The main output is methane rich biogas, which is combusted to generate electricity and heat, or can be processed into renewable natural gas and transportation fuels. The byproduct of anaerobic digestion is organic fertilizer that can be sold or put back on the Giant King Grass plantation. 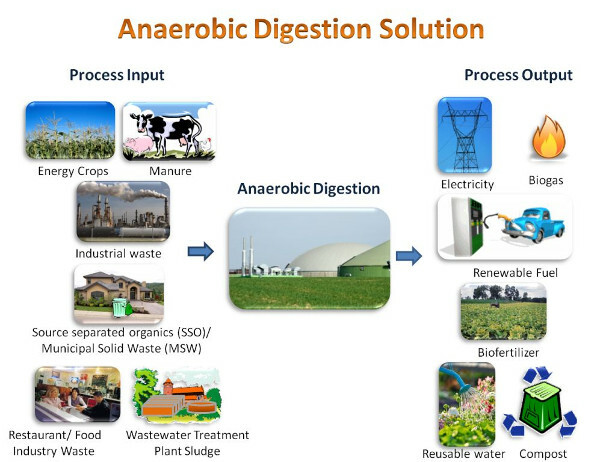 Anaerobic digestion is similar to the process that occurs in a cow stomach. Giant King Grass is an excellent feedstock for anaerobic digestion. It can be digested alone, or combined with other organic feedstock as shown in the figure above. Giant King Grass has been extensively tested for anaerobic digestion and the output of the digester is biogas which is approximately 60% methane and 40% carbon dioxide. This biogas can be used directly to fuel an internal combustion engine that turns a generator to produce electricity. foreground with a typical engine generator shown in the insert. 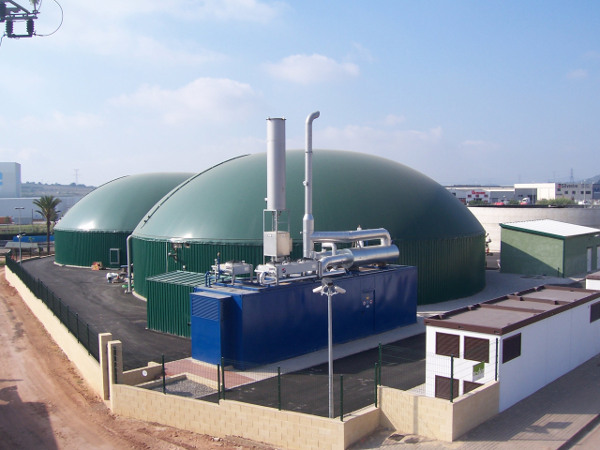 Anaerobic digestion power plants are extremely mature and reliable. There are more than 17,000 operating in Europe alone. They are typically smaller than direct combustion power plants ranging in size from 0.5-10 megawatts. The cost of anaerobic digester power plants has come down in recent years, but they are still a bit more expensive per megawatt than the larger direct combustion power plants. The engine generators for biogas power plants are available from many manufacturers including top brands such as Caterpillar, General Electric, MAN, MWM as well as suppliers from India and China. One interesting option with a biogas power plant is to be able to store biogas in an external gas holder. With gas storage, a biogas power plant is able to meet fluctuating demand. Gas is produced continuously and fed into an external gas holder. An example is shown below. When demand is high, the additional gas needed is taken from the gas holder, which is refilled when the gas demand is lower. The external gas holder serves a function similar to a battery, except it is the gas being stored not the electricity. 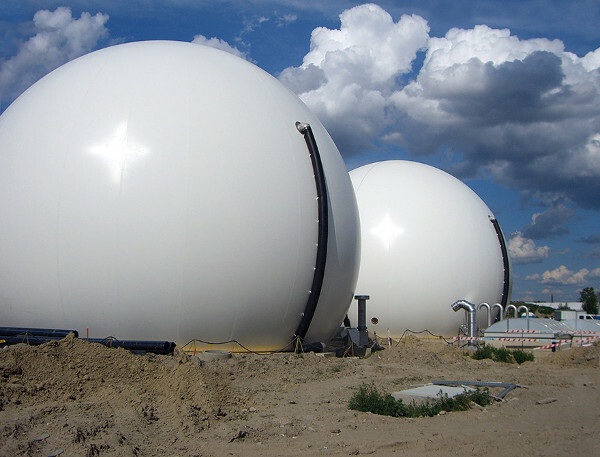 Example of an external biogas holder to store natural gas and enable the power plant to meet fluctuating demand.